We’ve been baking up a storm recently. Yes, even I (“maker”) am inserting myself smack dab in the middle of the confectioner’s sugar and flour melee! The dogs are thrilled. Ollie literally sat behind me in the kitchen, nose up, tongue out, licking the sweet air as I sifted 16 cups of confectioners sugar for buttercream frosting. I inherited my mom’s endless search for a homemade vanilla/yellow cake that satisfied my picky palate. I was lucky enough to grow up surrounded by home baked goods. The only thing my mom and grandmother ever made from a box was Jiffy cornbread. My dad is famous for his amazing breads and blueberry muffins…oh and his raspberry & peach jams. Lucky, yes…but I’ll never forget my first taste of yellow box cake at a friend’s birthday party. I begged & begged my mom for a box cake for the next several birthdays. She refused but spent lots of time researching cookbooks & experimenting with recipes trying to emulate that funkily delicious yellow box cake flavor. She even tried trickery — adding yellow food coloring to a sponge cake recipe — but I was not to be fooled! Fortunately, our current searches for recipes have broadened immensely thanks to the interwebs. It’s how I stumbled upon, quite possibly, the best vanilla cake recipe I’ve ever made. I think my search is over! It’s been a long time coming & there were certainly false glimpses of hope. Like the time a friend shared a recipe online for the famous Party Favors (a local bakery) cupcakes. They’ve mastered the yellow cake from scratch. It’s honestly INSANELY good. Like so good, it was our wedding cake — plain & simple yellow cake with vanilla buttercream. The recipe can be found here, BUT I must warn you, it’s not worth your time. 1) I’m sure they didn’t share the actual recipe. 2) It doesn’t seem quite right — as is sometimes the case when bakers/cooks try to scale down BIG recipes for the home baker/cook. The recommended buttercream frosting recipe is amazing. I’ve also shared it below. 1) Preheat oven to 350°F. Line 2 cupcake tins with cupcake wrappers and set aside. 2) Sift together flour, baking powder, baking soda, and salt in a medium bowl. In a large mixing bowl, beat butter and sugar in a large bowl with an electric mixer at medium speed until pale and fluffy, then beat in vanilla. Add eggs 1 at a time, beating well and scraping down the bowl after each addition. At low speed, beat in buttermilk until just combined (mixture will look curdled…don’t panic…this is exactly how it should look). Add flour mixture in three batches, mixing until each addition is just incorporated. 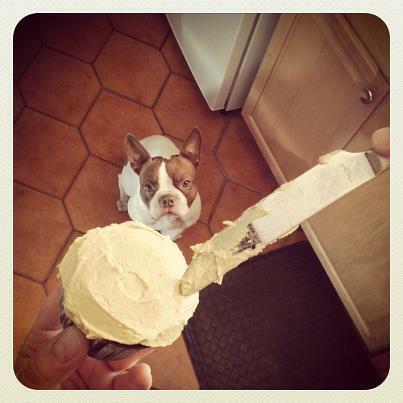 3) Use an ice cream scoop, ladle or large cookie dough scoop to fill each cupcake wrapper about 2/3 full. Rap each pan on counter several times to eliminate air bubbles. 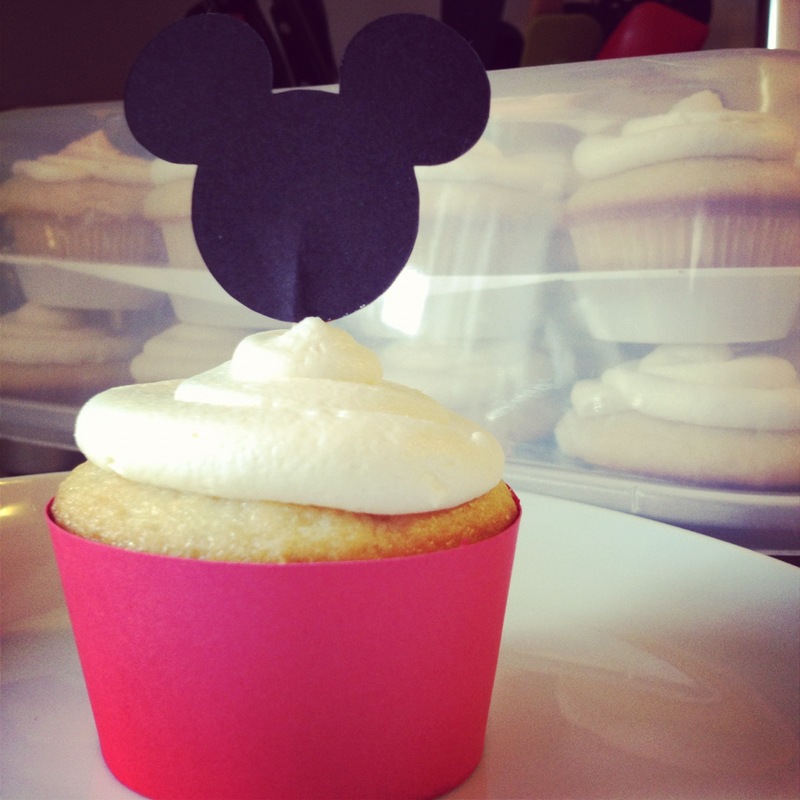 Bake until golden and a wooden pick inserted in center of a cupcake comes out clean – 20 minutes. If your oven is a little wonky, like ours, rotate the cupcake tins after 14 minutes. Cool the cupcakes in the tins on a wire rack for 10 minutes. Remove from tins & let cool completely on a wire rack. 1) In a large bowl, beat (or “cream”) shortening and butter with an electric mixer until light and fluffy. 2) Add vanilla, mix well. 3) Note: I hate sifting but trust me, you must. It’s important that you sift the confectioner’s sugar BEFORE you measure it (or you’ll end up adding too much sugar to your frosting & it will be a little too stiff/sweet). Gradually add sugar, one cup at a time, beating well on medium speed; scrape sides and bottom of bowl often. When all sugar is mixed in, frosting will appear dry. Add milk; beat at medium speed until light and fluffy. 4) Have fun decorating! As you can see, we love using pastry bags & decorative tips to add gobs of frosting. Oh, and when peanut butter buttercream is involved, Ollie is Head of QC (see photo below). 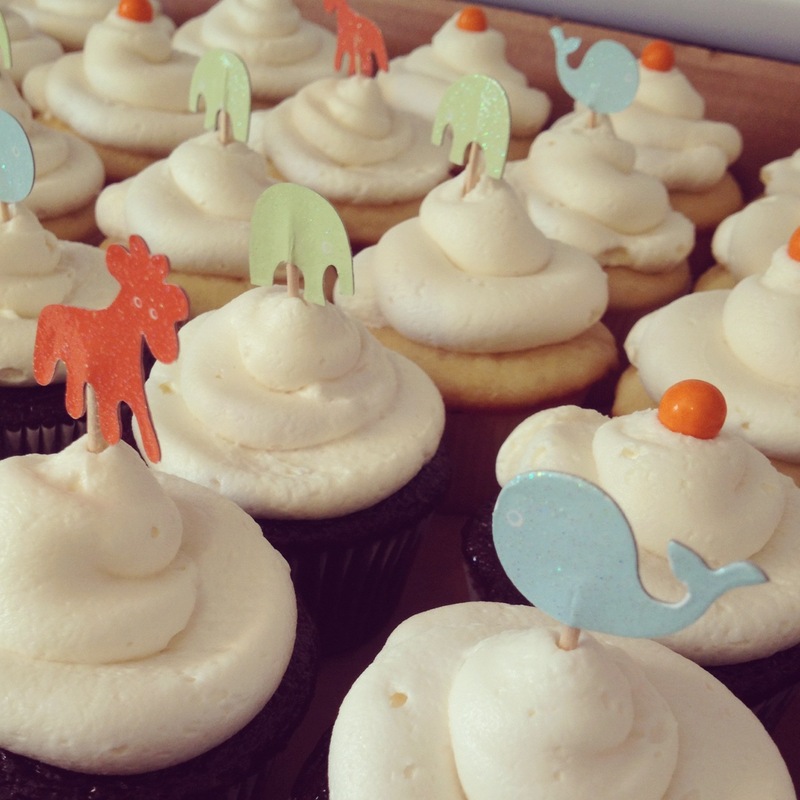 ENJOY and happy Vanilla Cupcake Day! Wheeeee!